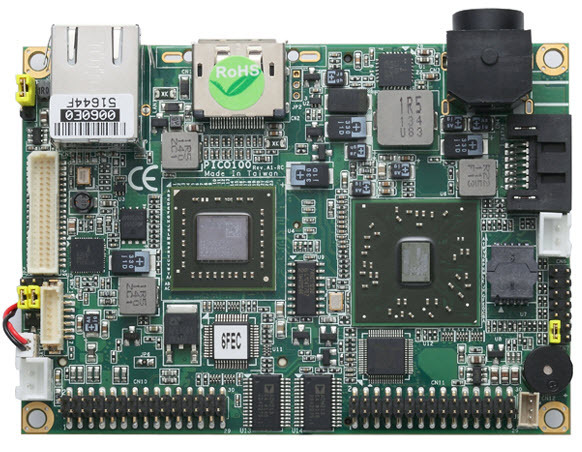 The PICO100, a new super-compact, low-power Pico-ITX SBC is powered by either a single core AMD G-Series APU T40R at 1.0GHz or a dual core T40E at 1.0 GHz paired with AMD FCH A50M chipset. One onboard SO-DIMM socket supports up to 4GB of DDR3 1066 memory. 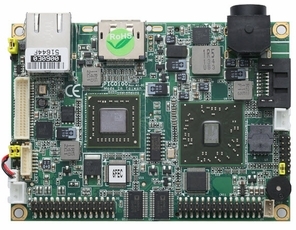 Integrated with Radeon HD 6250 graphics controller with DirectX 11 support, the PICO100 offers advanced 3D graphics and supports multiple displays via DisplayPort or VGA and 18-bit single channel LVDS panel. This system only requires +5V DC power input. The PICO100 is perfect for car PCs, in-flight entertainment systems, and even portable devices like thin clients and high-end medical imaging devices, where there are demands for extremely compact-size, fanless operation, low power, great graphics performance, and versatile I/O.